The ethical filter is a simple theoretical instrument that helps the mediator to manage a conflict of interests inside the mediation process, in order to guarantee a neutral and independent approach. It is a three decisional steps process that allows the mediator to evaluate information that is likely to affect his neutrality. The first question that the mediator addresses himself during the entire mediation process: “Is this information likely to affect my neutrality?” will generate the first decision. The information may regard a direct or indirect link with a party in the past, an allegation from the parties regarding something that the mediator did or said, basically any information that puts the mediator’s independence in jeopardy. If the answer is NO, the mediation can continue without any prejudice. If the answer is YES, the mediator is in the middle of a potential conflict of interests that must be analyzed and managed properly. A mediator can answer YES to this question if there’s a risk that the parties of even him (or her) see impacts in the mediator’s independence when considering “the information”. The second question regards the analyses of the potential conflict of interests: “Does this information affect my neutrality?” (Do I feel independent anymore?) As before, this question has two answers. Those both answers must be given in regard of the mediator’s perspective and of the society’s perspective (rules) about the notion of conflict of interests. If the answer is YES, the mediator’s neutrality is affected according to the mediator; the next step is the closure of the mediation process. In this case, before closure, the mediator makes a presentation of the context (carefully considering the confidential information) and informs the parties about why there is a conflict of interests (presentation of the self-analysis). 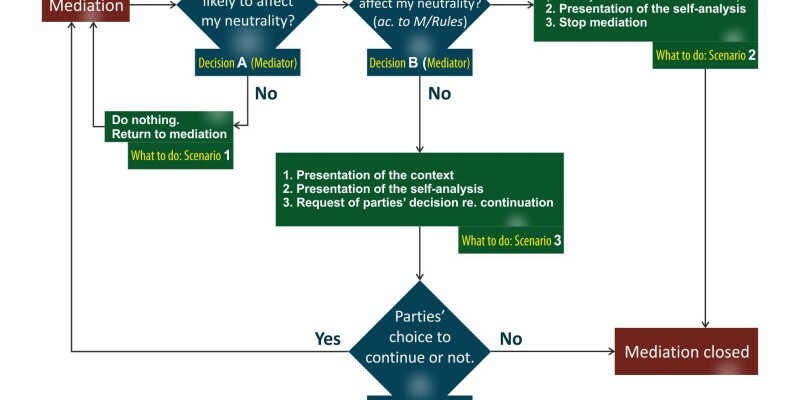 If the answer is NO, as in “this information does not affect my neutrality” as a result of a self-analysis of the mediator, than is the parties decision to go on with, or to close the mediation process. So, there goes the third question, which the mediator addresses to the parties: “In these circumstances, what do you choose to do about this mediation?” The parties have to make a decision fully aware of the potential conflict of interests, therefore the mediator, before asking this question, must be transparent, reveal the context and inform the parties about the self-analysis conclusion (Decision B). The parties then will decide if the mediation will continue or if the mediation will be closed due to the revealed conflict of interests. This process may be useful for both the supply and the demand side of the profession because it is simply enhancing the mediator’s neutrality, while suggesting disclosure and cooperation in order to deal with potential conflicts of interest effectively. The first decision, Decision A is somehow automatic, unconscious, it should apply to all the information that we learn as mediators in a mediation setting. Is should be more and more in our instinct with every case. Whatever is being “filtered” as potential conflict of interest and goes through the Decision A with a Yes, should trigger a more conscious process that starts with the Decision B. Then, there are two possible scenarios – Scenario 2 and 3 – back into the mediation or to its closure. Parties and cases can challenge us as mediators with all sorts of dilemmas, where is difficult to decide what to do, what is the limit of our activity, when do we say stop and when do we ask the parties if they want to stop the process. Sometimes, we look everywhere for answers to the question “What to do?”, except where the answer really is – inside ourselves. We only need to be self-aware.